Home / Mark Ashton / Other / Should Spotify scrap its free access? Should Spotify scrap its free access? Universal want Spotify to scrap free access to their service, but is it really a good idea? In 2009 my world changed when my friend asked me to change the track on her laptop, I was introduced to Spotify. Software that allowed you to listen to almost any music, for absolutely free, legally, in exchange for hearing some annoying adverts. The concept isn’t new; radio has been doing the same thing for years but now I have control of the music. It was like being given an unlimited budget to spend on iTunes, but without the effort of having to actually download each album or track I wanted to listen to. For actual free. I had my doubts, I didn’t like the idea of not owning CDs when digital downloads were introduced, I’m that person that likes to go out on release day and pick up a physical CD, flick through the booklet, and generally geek out at new material for an hour. The idea of just downloading an intangible digital file wasn’t my idea of perfection. So not owning anything and simply streaming it as and when I wanted to listen seemed pretty damn crap. It almost made me feel passive in the situation. I didn’t feel like I had an active role in the music, I didn’t have a little of part of it that belonged to me, more that I was just observing. As a completely musically untalented yet would-love-to-be musician, I always imagined how awesome it would be to meet somebody in the street who said “Hey, I bought your album!”. The idea that someone enjoyed your work enough when they heard it on the radio or TV that they would go out to a shop and give people their money to get your album seems awesome to me. When you’re faced with an endless choice of music at your fingertips, simply searching for an artist and clicking play doesn’t have that same effect; “Hey, I listened to you on Spotify” doesn’t really hit it as hard. It just doesn’t have that same level of commitment or involvement. It’s not so much of an ‘honour’. But I quickly began to realise that it doesn’t really matter. Spotify isn’t replacing the purchase of physical CDs, it’s supplementing it. With copyright law being effectively unable to protect music in modern times and music piracy becoming the norm, Spotify helps to reclaim some of the revenue lost through record sales, it adds an extra level of revenue when real life sales are low. I have artists who I will always purchase a physical copy of their music, and there are lots of artists who I enjoy, but probably never would’ve bothered to go out and buy their record. Often I’ll listen on Spotify and later consider myself a fan and buy their music, go to shows. Other times I’ll just listen on Spotify and be happy with that. But if Spotify wasn’t there, I probably wouldn’t go and buy their record. Spotify, at least for me, opened up the option to fully check out an artist’s work for free, to give it a good few listens and potentially gain more appreciation than I would otherwise, when I’d leave their physical CD on the shelf of HMV in favour of more obvious choices. To explore other music, what choice do I have? I can illegally download an album or not listen at all. People can’t spend what they did on music anymore, those times have passed for a lot of people. Hearing a few tracks that you like on the radio just can’t cut it enough to urge a purchase of a record anymore. People want to learn more and get to know the artist before they commit to buying an album, becoming a fan, attending gigs, buying merch. I think now there’s a stronger sense that an artist has to earn the right to a record sale; people have to be comfortable that they appreciate their music fully before then honour them by buying their album. Obviously exposure is a big part of this, talk shows, radio shows, daytime TV, entertainment shows get people to hear the songs, see the faces and enjoy the music. That used to be enough to secure a sale, but it’s not anymore. People are faced with sky high rents, energy bills and the cost of living. Paying 99p for one track that isn’t real doesn’t seem like an appealing option to a lot of people. Spotify is now my main method of listening music, it’s completely changed how I consume music. Instead of buying an album and listening an artist, album by album, I throw a playlist together. It could be a playlist of established favourites, or a playlist of new music I like the look of, or even old music I’ve just stumbled upon. I get a feel for artists and if I really appreciate what they do I go and buy their music. And I’m a pretty good buyer, if I like someone I can’t just buy one copy of an album. I’d then get another for the car, and one for my best friend’s car and then another during a long road trip in a car lacking the presence of decent music. Okay, so that completely contradicts what I previously said about disposable income, but hey, sometimes good music is better than food. I appreciate music, and I quickly came to realise that for the cost of one record a month I can have unlimited, uninterrupted access to (almost) whatever music I want and then some more, on my laptop, phone, TV. Now I pay a monthly subscription for premium access and I will continue to do so while I can afford to (that is unless Spotify start being naughty) and I feel like I have that ‘part’ in music still, as small as it is, that supports the industry and in turn allows people to keep making great music. According to NME, one of the major three record labels, Universal, are using their licensing negotiations with Spotify to persuade them to drop free access to the service. 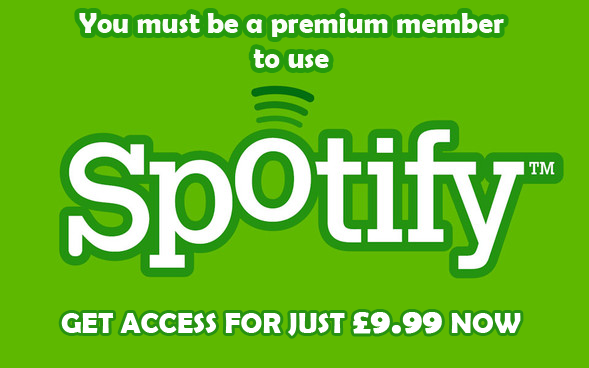 Spotify stand clear on their point that without free, premium doesn’t work. As a premium user, I completely agree. Let’s hope that Universal drop their requests and don’t push Spotify into submission, or threaten to remove their music from the service. Free earns money, it may be in a different way and it may be slightly less, but it earns. Historically the music industry has had several meltdowns over the change in the consumption of music, and each time they’ve cried that they’re being ‘ruined’, but they never were, it was never ‘over’, it just changed. Stopping Spotify’s free service won’t increase record sales, it’ll just force more people to piracy and in turn earn less revenue. With each industry ‘shock’, money begins to be made in different places, things have to evolve and move forward. It’s not all just about record sales anymore. They’re not coming back. Photo disclaimer: for non-commercial use and as the primary means of visual identification with the article dedicated to the entity of the article. basically agree with everything you say, I still buy CDs and listen on spotify.